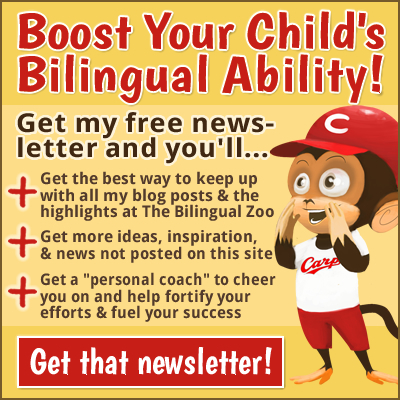 Raising a child with good bilingual ability is clearly the sum total of a whole range of ongoing efforts: It’s not one thing you do; it’s everything you do. Personally, I plan to make a valiant effort to read to my kids—fiction and nonfiction at increasingly sophisticated levels—until they’re grown and are finally free to run screaming from the house with their hands over their ears. In fact, I’m such a mad advocate of reading aloud that I have a whole heap of books on the subject. 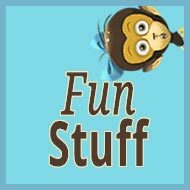 In this post I’ll share the titles and links with you, along with brief descriptions and some of the wise words they contain. 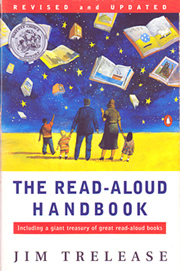 First published in 1979, and regularly revised and updated, The Read-Aloud Handbook, by Jim Trelease, is a classic—it’s the book that first persuaded me of the immense power and importance of reading aloud. After a thoughtful and well-researched discussion of the value and practice of reading aloud, Trelease provides a large treasury of great read-aloud books. 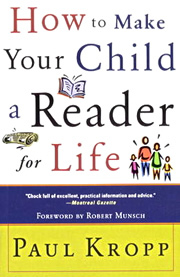 (See my earlier review of The Read-Aloud Handbook for a more detailed description of the book.) I also recommend a visit to his website. Reading aloud serves as a kind of commercial for the pleasures of reading. This in turn serves as a catalyst for the child wanting to read on his own. But it also provides a reading foundation by nurturing the child’s listening. Listening comprehension comes before reading comprehension. Take, for example, the word “enormous.” If a child has never heard the word “enormous,” he’ll never say the word. And if he’s neither heard it nor said it, imagine the difficulty when it’s time to read it and write it. The listening vocabulary is the reservoir of words that feeds the reading vocabulary pool. Begin a home library as soon as the child is born. If you can provide shelving in the child’s room for such books, all the better. The sooner children become accustomed to the sight of the covers, bindings, and pages of books, the sooner they will begin to develop the concept that books are a part of daily life. Once you have built a child’s attention span, it’s an easy jump to chapter books—either long picture books or short novels of 60 to 100 pages. These are books that don’t have to end with Monday—that can be stretched into Tuesday and Wednesday. Even preschoolers can enjoy chapter books. Reading Magic, by Australian author Mem Fox, is subtitled “Why Reading Aloud to Our Children Will Change Their Lives Forever.” It’s a slim volume, and thin on suggested titles, but the author’s keen passion for the subject has produced an inspiring “love letter” on reading aloud to parents everywhere. As a popular author of children’s books, with years of experience reading aloud to children, she shares helpful tips (on her website, too) for making the most of your read-aloud practice. If [children] are read to often in their bassinets with joy and noisy love, and also with soothing sweetness, we hook them into associating books with happiness before they can crawl away from us to explore the rest of the world. The big thing to remember is to read aloud with happiness in mind, not education. We’ll get it all wrong if we think only about education. Learning to read comes from the happiness of reading. 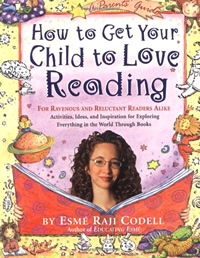 Compiled by educator and author Esmé Raji Codell, How to Get Your Child to Love Reading is a fabulous 500 pages of suggested titles (over 3,000 of them), grouped by theme, along with a potpourri of ideas and information on the subject of reading. It’s a unique book, full of wise advice and engaging wit—a fun, helpful resource to own. The only drawback, I suppose, is that the book was published in 2003, so it doesn’t include titles from the past ten years. Still, if you’re serious about children’s books, it’s reasonably current and well worth the modest cost. Her website (she calls herself a “readiologist”) may be of interest, too. It is hard to believe an activity only slightly more kinetic than television viewing could yield results that verge on the miraculous. 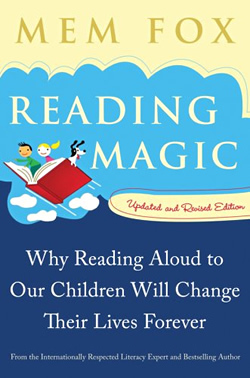 But the results are in: Read-aloud is one of the extremely rare methods in education with positive results based not only in theory, but in reality, too. The act of read-aloud is so easy and natural to do, and can be so enjoyable, that many parents (and teachers, too) feel it must be more appropriate and beneficial for younger children. This is a fallacy, and a very dangerous one: The fall-off of read-aloud can be correlated to the fall-off of interest in reading, with 90 percent of fifth-graders spending less than 1 percent of their time reading. Through books and stories that are designed to be read aloud, we convey to our children the beauty of language and the joys of rhythm and rhyme; and in the books we choose to read and the way we read them, we also convey the values we hold dear. The most powerful work you can do for the world begins in your home, with the intimacy of one book. There is no better teacher than you, no better mentor, no better role model. Your connection to literacy will inspire your children to read to their children, and they to theirs. Never underestimate the power of the read-aloud to bring comfort to your child. 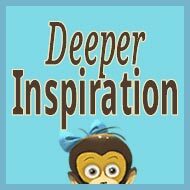 The world outside can be hard, especially for a young child trying to navigate his way through social relationships, school, his worries and fears, teachers, and other adults, along with the news of the world swirling around him, most of which he is picking up on in ways you might not even imagine. Books provide ways to talk about all of this. Books say that yes, happy endings are possible. Books say that if the ending is not necessarily resolved, there are people out there practicing courage and also navigating the world just like you. Paul Kropp, a veteran teacher and novelist, packs his book with information and advice on the stages of reading development. He begins by encouraging the practice of reading aloud and proceeds to address the lifelong process of becoming an accomplished reader, from infancy to adulthood. 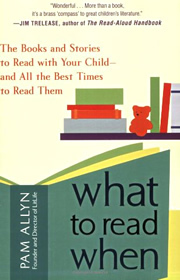 Along the way, he provides lists of recommended titles for each age range and devotes space to special issues like “Dealing with the Reluctant Reader” and “Nurturing the Gifted Reader.” Though last revised in 1996, How to Make Your Child a Reader for Life remains an excellent choice for a comprehensive view of the subject, including the importance of reading aloud throughout the childhood years. His range of fiction for young readers can be explored at his website. I cannot emphasize enough your own importance as a motivator for reading. Your attitude toward reading—expressed in what you do more than in what you say—is vital in motivating your child to be a reader. If you take the time to read with your child every day, then the physical act of reading will always be associated in her mind with warmth, safety, and love. If you surround yourself with books, magazines, and newspapers, and make time to read yourself, then your child will see reading as something adults do. According to statistics, your attitude toward reading is the strongest predictor of whether your child will be a reader or not. That’s why you are so important all along the way. 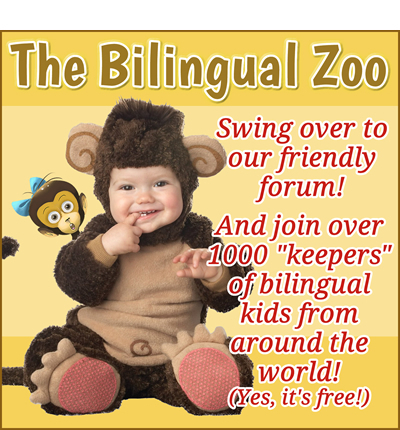 Reading opens a door to language for your child that would otherwise remain closed. It allows her to hear longer sentences, more carefully structured and beautifully balanced than those of everyday speech. What’s more, reading creates windows on parts of the world and experiences that your child will never get to know otherwise. 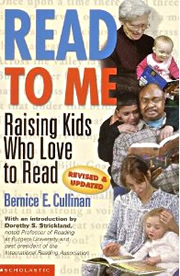 Read to Me, by reading specialist Bernice Cullinan, provides useful information and practical ideas on literacy development. Beginning with an emphasis on reading aloud, the book features chapters which focus on each stage of a child’s growth, from birth to the age of 12, with plenty of real-world tips on nurturing reading and writing ability. Though last revised in 2000, and now apparently out of print (though inexpensive used copies can be found), it remains a good guidebook on the subject, straightforward and full of helpful advice. Your children will always remember the special things you gave them when they were young. Books should be among their childhood memories. If they have warm memories of cuddling with a parent and a good story, they associate those happy feelings with reading as they strike out to read alone. The feelings remain long after the stories are forgotten. The music of language is one of its great joys, and one of its most powerful attractions for children. 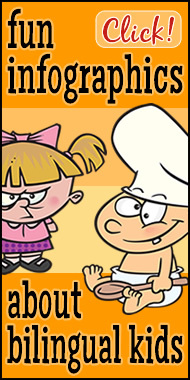 Poems are especially entertaining for children because the words rhyme and are fun to say. 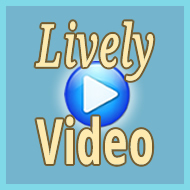 Verses encourage children to bounce around while saying the words. 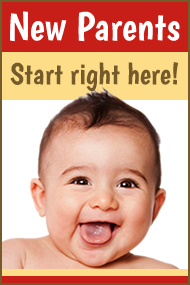 The words match the rhythm of a child’s movements; the rhythm underscores the words’ meaning. Read the same poems to your children over and over again; you’ll soon hear familiar phrases fall trippingly from their tongues. Parents need to know that children will get far more benefit from being read to, from seeing parents read for pleasure, and from reading comics, magazines, and books, than they will from working through workbooks. 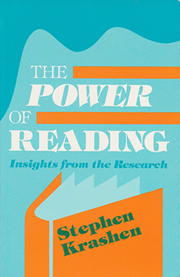 Want more information and ideas on reading? 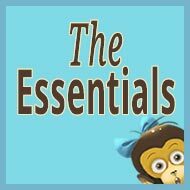 Just head to the reading category for all my articles on the subject! How about you? Have an opinion on any of these books? Can you suggest another useful book on the subject? I cannot suggest anything useful for reading in English but I have noticed that blogging can be an incentive for writing. 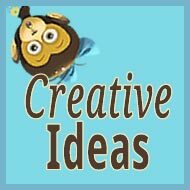 My eldest daughter started to blog at school and I took the idea and helped her start a real blog. When my own kids are a little older, I’ll definitely pursue this with them. 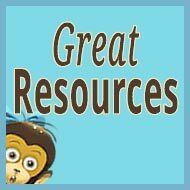 What wonderful resources you’ve compiled! I’m a speech/language therapist and I couldn’t agree more with you about the importance of reading aloud. I received your mail this morning while I was exactly already hooked here at your site! So, I am so excited to see your response right away! Anyway, thank you for sharing all the best! You don’t know how a big help you are to all the parents all over the world! My 2-year-old son showed interest in books even before he turned 1. Maybe because I read to him occasionally and I think he loves it! But I don’t read to him consistently or everyday. The day I found your site, and then started to read your articles, that also marked the day that I started to feel guilty and panic! I just noticed lately that he is not already demanding me to read books. And I was completely unaware that I am the culprit in cutting his developments and love for reading. Thank you for opening my eyes! Since then I am trying to read to him everyday! I don’t clean the house when he is awake at daytime! We talk and play in English all day long. I manage things at night! Yes, it is so tiring! But the guilt in me is still here and that is the most tiring! I hope he will come to me and ask to be read again, soon! He is sometimes holding the books alone, but not calling my attention until now, and that is crashing my heart! I will do my best to get back on track! I’m on panic too because he suddenly stops responding to me in English, though, he understands what I’ve said. I am afraid I already failed to raise him bilingual. What do you think! Please lend me a strong heart, Adam! Raira, please take a big breath. 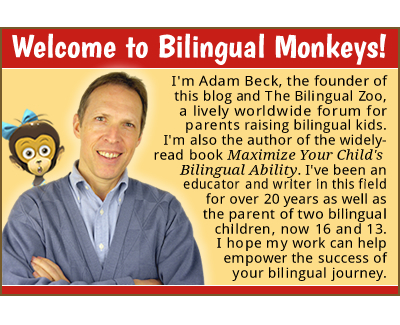 Always remember: A happy, healthy relationship with your son will always be more important than the bilingual goal. Don’t let yourself get so stressed out about this that it affects your own peace of mind and your family ties. Just continue to do the best you can, day by day, with a light and playful spirit. Wow, thank you for this post! This would be the answer to my question earlier in the e-mail. My son is five months old and he already has his own bookshelf with his books. We buy him a book every month. I would like my son to read for pleasure, to understand that if he wants to speak and write well, he should read. Thank you once more for this post! Lots of useful titles, just what I was looking for. Adam, it helps to know how often I should read to him because I wasn’t using every day for reading. I was having problems with reading time (using bed time for reading but he would fall asleep so fast, bless him , that I didn’t have time to finish the story). Now, I usually read to him at noon. He listens carefully and I’ve noticed that he is looking more at my mouth than at the pages of the book. It also makes me feel happy to spend quality time with my son. I’m really glad to hear this, Vesna. Yes, a persistent practice of reading aloud each day (and sometimes bedtime isn’t the best time!) 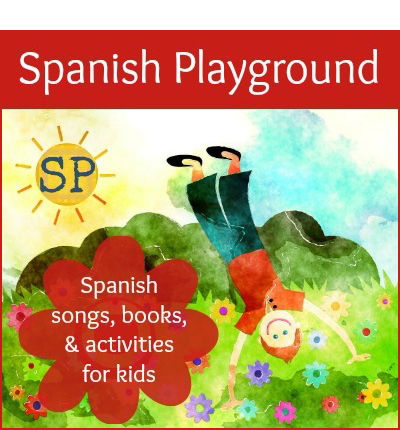 is important for both the child and parent: for the child, it provides crucial, and more complex, language input; for the parent, it establishes a firm habit that becomes much harder to neglect. And, for both—as you’re experiencing with your son—it offers a wonderful opportunity to deepen the parent-child bond on a daily basis. Let’s keep reading!